Prickly but cute, the hedgehog captures the imagination of all ages. Beatrix Potter's washerwoman, Mrs. Tiggy-Winkle and, more recently, Sonic the Hedgehog delight readers and gamers, and this friendly little creature is a pet in numerous homes where her nocturnal habits make her an ideal daytime companion. Typically, pet hedgehogs in the United States are African hedgehogs, but many more species are living in the wild. Hedgehogs come from Europe, Asia and Africa. There are four broad genera, containing 15 species. The broad classifications relate to the hedgehog's native regions. Westerners are more familiar with the European and African species, largely because the European breed is the one typically illustrated in children's books, and the two African "Atelerix" species are crossbred as pets in the U.S. Lesser known breeds originate in desert and steppe habitats stretching from the African Sahara to the Mongolian Gobi desert. Federal and state laws control hedgehog breeding in the U.S. Breeders, sellers and show exhibitors each need a U.S. Department of Agriculture license. The Erinaceus europaeus genus is native to the British Isles and other European countries, such as France and Italy. 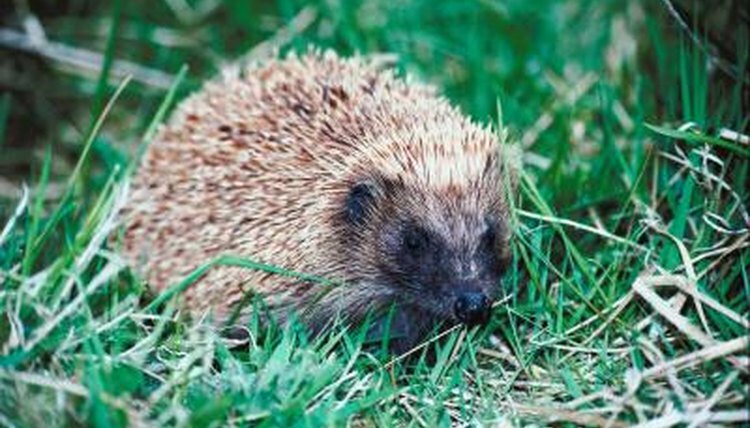 Although the hedgehog primarily is a countryside dweller, she also makes her way into suburban gardens. Unfortunately, the rise in automobiles over the last several decades has increased the number of hedgehog road deaths. Wildlife UK reports that most wild hedgehogs live only for two years despite having an average life span of 14 years; accidents and loss of habitat are responsible for this. Between 9 and 14 inches in length, and with an adult weight of around 5 pounds, this is the largest of all the hedgehog breeds. Characteristically brown in color, and with furry bellies and faces, this hedgehog dines on beetles, slugs and snails in the wild. From the Atelerix genus comes the two African species used in breeding the pet variety found typically in the U.S. Atelerix albiventris, or the four toed hedgehog, hails from southern African countries, and predominantly is a desert and savannah dweller. She measures between 7 and 9 inches, and weighs 12 to 24 ounces. The North African species Atelerix algirus is somewhat bigger: she measures 8 to 14 inches and weighs approximately 14 to 35 ounces. She resides primarily in Algeria, hence she's also known as the Algerian hedgehog, and in the countries across North Africa. She has five toes on her back feet and a longer face than her southern African relative. In appearance, both have chocolate colored quills and a white belly. The Hemiechinus auritis breed, commonly called the Long-Eared hedgehog, lives in the steppes of Turkestan, Afghanistan, and the plains and deserts of Mongolia, and in parts of the Middle East, such as Israel, Iraq and Iran. The smallest of the hedgehogs, she weighs as little as 7 ounces, although larger members can weigh in at 24 ounces, ounces and measures 5 to 8 inches. Her ears are distinctly longer than other hedgehogs' and she has dark brown or creamy colored belly fur and brownish quills. The Paraechinus hedgehog family are desert hedgehogs found in Ethopia, Pakistan, India and the Middle East. This family, which has three subspecies, are a paler color than other hedgehogs. Generally, they have darker faces and the Indian hedgehog has a pointier nose than his relatives.